Shorter began his art studies at The Toledo Museum of Art at an early age and art remained the focus of his formal education. He attended Libbey High School and won numerous state scholastic art awards and then entered Bowling Green State University as an art major. Life and work took the aspiring artist in another direction however. He became a civil structural engineer and, with a partner, formed a company – Morse and Shorter – to continue in that field. Most of Shorter’s daytime gig involved, as he notes, “working with my eyes.” So it was fairly difficult to give his art the attention he thought it required after days spent assessing and competing projects requiring such concentration of mind and eye. Morse and Shorter gave up the firm a year ago as both partners went into retirement and Shorter began to place more emphasis on his avocation – his art. He had kept his hand in art doing commissioned pieces from time to time but now he is free to let his imagination roam. Over the years, he has created a number of such commissioned works of athletes. Some of his recent drawings include several works of President Obama and depictions of equine athletes for 20 North Gallery’s Derby Days Exhibit. 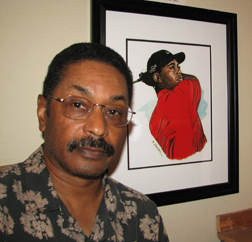 Shorter’s Obama and Tiger Woods may be seen at The Truth Gallery.